"Vegemite is made from used brewers' yeast extract, a by-product of beer manufacturing, and various vegetable and spice additives. It is salty, slightly bitter, and malty — similar to beef bouillon. The texture is smooth and sticky. It is not as intensely flavoured as British Marmite and it is less sweet than the New Zealand version of Marmite." I've got one in the fridge! Actually Pete, many of us in Singapore grew up on it too! Marmite was also popular as it was cheaper. There was another one Bovril. Again it had a different taste somewhat. 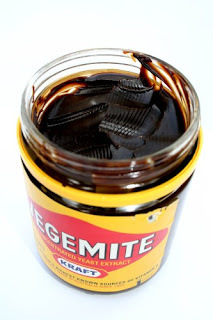 i asked this question while at tech college, vegemite is made from yeast being feed molasses, being a living bacteria it eats the mollasses coz it LOVES Sugars it then deficates out vegemite. so its really yeast poo, but dont tell the kids that, they will never eat it again! 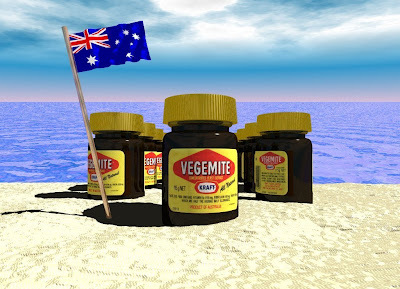 i'm in macau i also have no problem getting the much loved vegemite!